It’s been way too long since I last posted about Ridiculous Street Signs. For those of you unsure of what I am talking about, here are a few details. A few days back I wrote about Funny Signs You’d Only See In Britain from Buzzfeed. Buzzfeed’s story includes 41 signs of which I decided to share 6 of them in my post. At the end of my post, I mentioned that I was looking for contributor photos of ridiculous street signs. Don’t forget to enter my giveaway for a chance to win 1 of 5 Gogo Passes! I was happy to receive an e-mail from my friend and fellow BoardingArea blogger Rene, writer of the blog DeltaPoints. The subject of the e-mail was related to a favorite thing that I randomly come across at home and while traveling- Street Signs! I recently received an e-mail from Jason with the subject Ridiculous Street Signs. He wanted to share a sign that he came across while on a trip to Africa! Jason works in international business and has been writing the BoardingArea blog Milesquest since 2008. Kim and I had the pleasure of meeting and chatting with Jason and his wife at the BoardingArea Conference (aka BAcon) back in May. We then ran into them at the airport in Denver while waiting for our flight to New Orleans. After receving Jason’s e-mail I sent him a few questions to find out a little more about his sign photo. While checking out Twitter last week, I came across a tweet by Gary Arndt (@EverywhereTrip) which caught my interest. 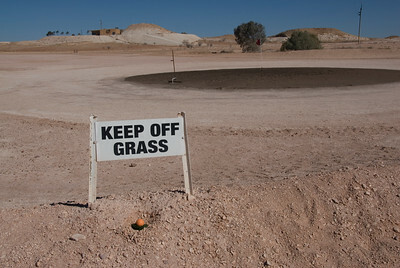 The tweet said “An easy sign to follow in Coober Pedy, South Australia”. A link to a daily travel photo that Gary had posted to his blog in 2010 was included. Gary writes the very popular, award winning travel blog Everything Everywhere. He’s been traveling around the world for over six years, visiting many interesting places and taking incredible photos along the way. Last year I was chatting with my friend Dennis, the Lufthansa Flyer about my Ridiculous Street Signs photos and tab. After looking through my photos he told me about a street sign photo of his own that he wanted to share. When I decided to add reader contributed Ridiculous Street Signs photos, the sign that Dennis had sent me came to mind. I contacted Dennis to see if he would like his sign featured in a post and he was more than happy to answer a few questions about it. MW: What country & city was the sign spotted in? MW: When did you spot the sign? MW: Where was it located? MW: Is there anything else of importance about the sign? Well there you have it. Thanks Dennis for sending in this Ridiculous Street Sign! Check out Dennis’ blog Lufthansa Flyer here. It’s been a while since I’ve posted a Ridiculous Street Signs photo. I’ve been meaning to do so but it’s just not that easy. You don’t just plan to find and photograph an odd or ridiculous sign- usually you just happen to come across them when you least expect it. That’s at least how it has always worked for me. I’ve been toying with the idea of posting reader contributed Ridiculous Street Signs photos. I hadn’t thought about it in awhile, but was reminded of the idea a couple of weeks ago when I received an email. The e-mail was from my friend Rene who blogs over at DeltaPoints. The subject of the e-mail was “a gift for your blog”. I was curious what it could be. The gift ended up being really awesome. It was a Ridiculous Street Sign photo from Rene’s recent trip to Grand Cayman.